From October 2015 until March 2016, the period during which our shoot took place at Hampshire Street Studio, we welcomed a number of visitors keen on learning more about our work or involved in the project itself. All visitors brought some excitement and a burst of enthusiasm to the studio, as they transmitted the huge expectation around this unique online catalogue. 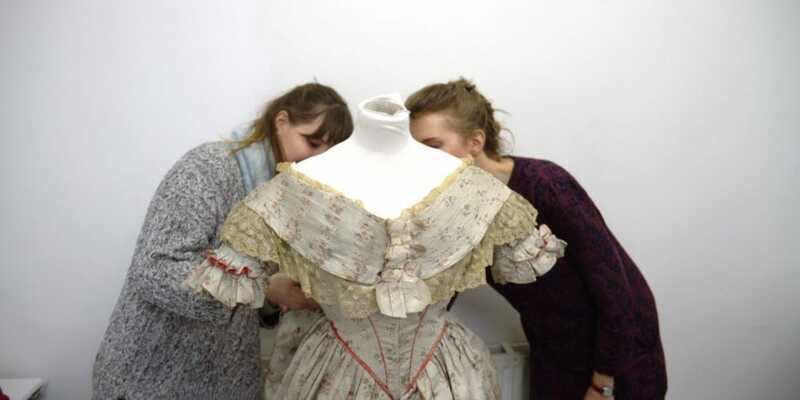 BFI curators Claire Smith and Nathalie Morris, both costume lovers and collaborators, had the opportunity to see our team of volunteers and specialists in action and admire some 19th Century dresses that were being mounted and photographed at the time. Both Claire and Nathalie showed great interest in our working process, given the fact that the setting – a studio-, the objects and the final goal of this project- a digital catalogue- vary greatly from the materials they work with for also very different purposes. Beatrice Behlen, Senior curator, Fashion and Decorative Arts at the Museum of London, paid us a visit too and kindly invited some members of our team to visit the archives at her workplace in return. Beatrice, who is another strong supporter of this project, told us about the difficulties of archiving and storing a costume collection, no matter what its size is, and we learnt greatly from her ingenious solutions carried out at the Museum. For our volunteers, having the opportunity to discuss mounting and conservation techniques with high-profile curators was always a treat, and we are really grateful that Claire, Nathalie and Beatrice we able to spend some time at the studio. In February 2016, we received the visit of a large group of MLitt Dress and Textiles students from the University of Glasgow, together with their lecturer Sally Tuckett. We all spent a busy but very enjoyable day showing Sally and her students our workroom, the items our team was working with that week and Rebecca Clark, our on-set Mounting Assistant, explained how the garments were being photographed for the catalogue. This group was accompanied by Chris Garlick, Cosprop’s General Manager and Elizabeth Owen, Cosprop’s curator and librarian, together with the Project’s team managed by Rosa Fernandez Day. We discussed the outline of the project, from its very early stages, and at the end of the day, team and visitors had a preview of The John Bright website, a first for all of them that lead to many suggestions and interesting feedback.